Friday evening at the Maurice Bishop International Airport was not business as usual. Flights came and went as usual as far as anyone knew, but there was something pulsating from the Waving Art Gallery that sent the visitors to the opening reception of Godfrey Luke’s exhibit on a different sort of journey. 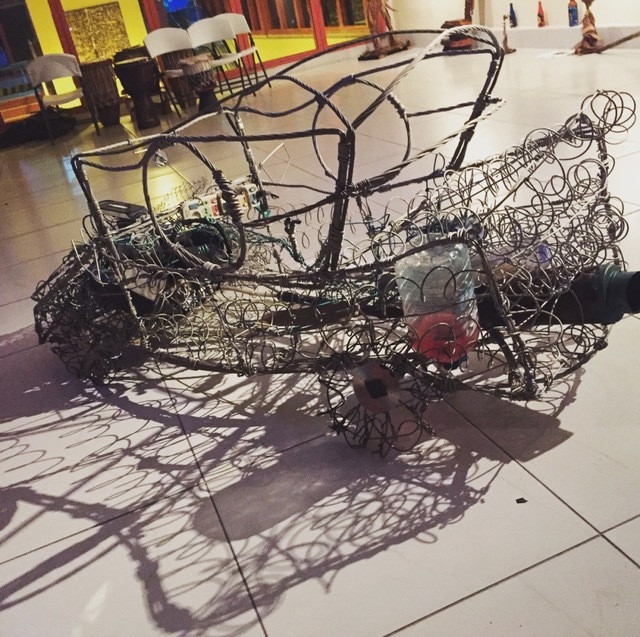 Godfrey Luke’s commitment to well-made sculptures, culture, and his tireless focus on education and development makes this exhibit and more than just an exhibit of sculptures made from recycled materials. This exhibit is an outpouring — the excess and abundance of love, community and the interconnective power of art to imagine a better world. In April 2018 Godfrey Luke will be opening ‘Chip and Chisel Museum’ in Calliste, St George. This will also be home to the Ashanti Footprints Performance Studio, which will be a space to make and share art as well as an avenue for cultural exchange, and a place to hosts artists in residence. Godfrey Luke is available for workshops in visual and performing arts. Look out for him with Chip & Chisel Museum, and Ashanti Footprints Performance Studio. The exhibit at the Waving Art Gallery will be open until mid-January 2018; visitors are encouraged to go and see it while it is up! 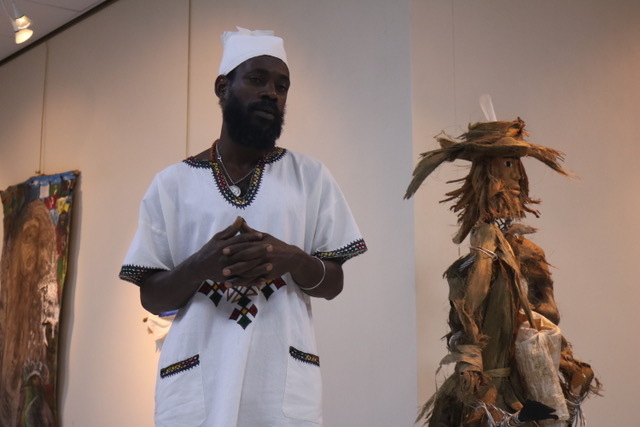 The exhibition was made possible by the partnership between Grenada Airport Authority and the Grenada Arts Council. Godfrey Luke can be contacted directly at godfreylukeartist@gmail.com.